Torc Ground Anchor - Series II - The Highest-Approved Ground Anchor! Why use a ground anchor? Why is the Torc ground anchor special? How do I know it is any good? Can I move it once fitted? The Torc Ground Anchor really is the best rated ground anchor on the market. No other anchor has Sold Secure Gold in every category. No other anchor uses a 20mm diameter hardened steel shackle that would have to be cut twice to defeat it and with a choice of six different fitting kits to get the best fixing for concrete floor, brick wall, block wall, concrete-in, awkward situations and even van! We have also been awarded Police Preferred Specification for our ground anchors (under the ACPO Secured-by-Design scheme). All this, and it is made in Britain. This page gives more information about the Torc ground anchor including the wide choice of fitting kits for it, and more technical information about our flagship product - the Torc Series II Ground Anchor. It does not take more than a few seconds for thieves to remove a bike, even when fitted with a disc lock or chain, unless it is chained to something. People usually ignore an alarm when it sounds. Chaining your bike to something solid and secure such as the Torc ground anchor makes it much less likely it will be stolen. The Torc ground anchor is not just suitable for motorcycles - it can be used for bicycles, cars, caravans, quad bikes, ATVs, ride-on lawnmowers and horse trailers. Virtually anything you don't want stolen! Torc ground anchor Series II - Why is it special? It is very secure - unlike some other bolt-in ground anchors the Torc Ground Anchor uses four of the highest quality fixings, rather than relying on poor quality fixings or a single bolt. 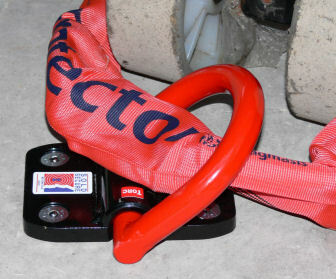 It uses a full 20mm diameter hardened steel shackle - compare with many other products that use just 12mm or even less! The shackle is case hardened and resists freezing, cutting and grinding attacks. It cannot be bolt-cropped. 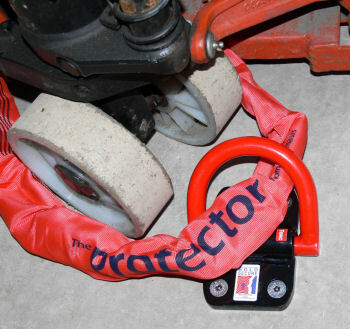 The shackle folds flat to make it harder for the thief to attack, whilst being more convenient for you to use. It can be fitted with DIY tools. Some ground anchors need to be concreted-in. Others require special tools to drill large holes, which you may have to hire. 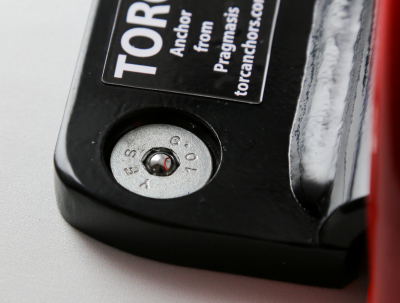 The Torc Ground Anchor can be fitted with a normal DIY drill. It is extremely versatile. There is no other ground anchor that comes with a choice of six different fitting kits! These are optimised for fitting to concrete floors, brick walls, block walls, vans, awkward bases/substrates and also for burying in fresh concrete. The Injection Resin or Concrete Floor kits are recommended for maximum strength, largely because concrete is stronger than brick but also because these kits use advanced chemical resin in place of expanding bolts. The resin achieves a much stronger bond with the concrete and the Injection Resin kits allow larger volumes of resin to be used to help deal with air spaces/voids in brickwork/blockwork and other awkward substrates. It is the only ground anchor with such a wide choice of fitting kit, even including one for use inside a van - if you want to secure your valuables inside your van, the Torc Ground Anchor is the ideal solution. This is excellent for race and off-road motorcycles, bicycles & quads as well as for tools and equipment in transit. It is Sold Secure Gold approved for all categories (Concrete Floor & Injection Resin fitting kits only; the other fitting kits have the Motorcycle/Quad/Bicycle/Car/Van/Commercial Gold accreditations). This means it has been tested and approved for use with motorcycles, bicycles, ATVs, caravans and trailers, cars and for commercial & agricultural equipment and plant. It is Police Preferred Specification - meaning genuine Police approval and suitable for credit points under the Code for Sustainable Homes initiative. It is large enough to take high quality large-link security chains that cannot be bolt-cropped. Many ground anchors cannot cope with these chains. Smaller chains can be bolt-cropped in seconds using tools favoured by thieves. 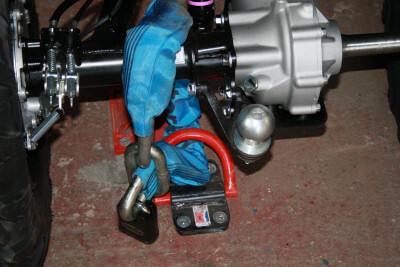 There is sufficient space for the shackle to take two 16mm Protector (or similar) chains, or a 19mm and a 16mm chain. It is also one of the very few anchors that will take the new Protector 22mm Titan chain, but that doesn't leave much space! It is Made in Britain - Support British industry! - and a Registered Design. The Torc Ground Anchor has been designed for easy DIY fit. The Torc Ground Anchor has been designed so that you can fit it in a wide range of situations using only DIY tools. The instructions are written in a detailed, step-by-step way to guide you through the process of achieving a high-security fitting without needing exotic tools or advanced skills. There are numerous pictures and we are happy to give advice by e-mail or phone. You should generally be able to fit the Torc Ground Anchor in less than an hour. The Torc Ground Anchor is available with a choice of six fitting kits to suit your application. No other ground anchor has the level of certification and the same choice of approved fitting kits! Each fitting kit is designed to give maximum security combined with ease of installation. Block Wall etc (with *eight* expanding bolts/shield anchors and a large sub-plate) New! Concrete-In (with steel bars and a sub-plate for burying in fresh concrete) New! Videos are available on the Fitting Kits page that give more detail on various fitting options. In each package you will get a full fitting kit and fitting instructions, together with all the relevant bolts. The concrete floor and injection resin kits include a 12mm masonry drill bit; the brick wall and block wall kits include a 16mm masonry bit. Those kits also include a length of plastic pipe to help you clean dust from the holes! We also list the detailed contents of each of the fitting kits. The chemical resin capsule and injection resin kits give the strongest result with existing concrete, but only if the concrete itself is good enough. Drilling a test hole in the right sort of position is the best way to judge it. We mention this in the videos above. Good quality concrete needs to be at least 120mm thick and solid to that depth, with no air pockets or voids, in order to use the resin capsule approach. That is the favourite and the strongest if the concrete is good. If the concrete is not so great, an Injection Resin kit can give the strength of resin, but it is more expensive and can't compensate for significantly poor concrete. The nominal Brick Wall fitting kit is the more universal one as it is less fussy about concrete quality, but the fixings are not as strong and it needs larger holes to be drilled so can be more fiddley. Beware that the expanding bolts in the Brick Wall fitting kit mean it should not be near the top or end of a wall - click for more explanation about suitability. We recommend drilling e.g. a 6mm diameter hole to 95mm depth (as that is the final depth for the resin kits). Anything up to 12mm diameter is OK, which is the final size for the resin kits. If you find the drill gives way underneath you, or if you break through into soil etc below, then the concrete is not good enough for resin capsules. Ditto if the concrete is crumbley and you are left with a rough hole. You can check the hole with a piece of wire or rod or a thin screwdriver, as we mention in the videos, to check the condition of the sides and bottom of the hole. You want good solid concrete and well formed holes with a solid bottom. If it's less than excellent then an Injection Resin kit can compensate by providing more resin (e.g. the 100ml cartridge provides approximately 2.5 times the volume of resin from the capsules, and the 150ml cartridge will be about 4 times as much as the capsules). Even that will not compensate for a huge void within or below the concrete. Situations like that are more easily handled by going for the nominal Brick Wall kit with expanding bolts (aka. Shield Anchors). If you really want the strongest possible result then cutting out a section of thin/poor concrete, digging down, and pouring fresh concrete with the Concrete-in anchor being installed in the same process can resolve major problems with concrete, albeit with more effort and cost. Please note that none of our fitting options are suitable to use on paving slabs or block paving. These are not suitable substrates for fitting any type of ground anchor. This is partly because the slabs or blocks will often simply lift away, with the anchor attached, if a thief attempts an attack. It can also be because simply trying to drill the holes to fit an anchor will cause the slab to crack into pieces. And if the drilling doesn't caue it to break up, a thief using a sledgehammer will probably have the same result! Using our anchors with shorter-than-standard bolts will not get around any of these problems. If you need to fit an anchor to an area with pavings slabs or block paving, the recommended approach is to lift one or more of them, to dig down, and lay fresh concrete and ideally fit a Torc anchor in the fresh concrete by means of the Concrete-in fitting kit, or to lay fresh concrete and leave it to set, and then fit an anchor with resin or other fixings afterwards, following the appropriate fitting instructions. Be accessible to you while locking up your valuables, but difficult to access for the thief. 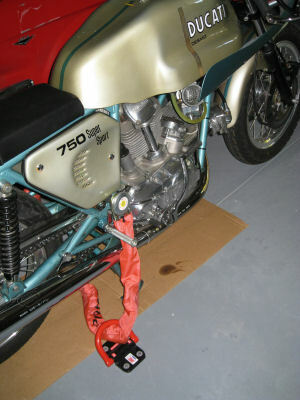 You could place the ground anchor on the floor near a wall, or on a wall, and then chain your motorcycle in front of it. This makes it difficult for a thief to attack the ground anchor/chain/lock. 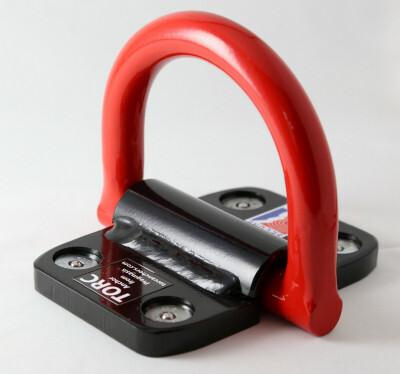 Allow you to fit the chain to your valuables without the chain or padlock dragging on the ground. This makes it much harder for the thief to attack the chain or padlock. Still allow you to use other security measures, such as a motorcycle cover. We offer detailed information on a separate page on the technical aspects of the Torc Ground Anchor Series II dimensions and manufacturing aspects. Please refer to the photos below to see views from various angles. There are lots of security devices on the market and it can be confusing to decide which ones are good and which ones aren't. One way of doing this is to ensure that any device you fit is tested by an independent organisation such as Sold Secure or accredited by the Police - the Torc ground anchor has both! We have more information on Torc ground anchor certification and testing and our approval certificates available online. The Torc anchor can cater for installation on the floor of a van, and even on suitable framing members on the van walls, inside a metal container, bike shed, etc. It is the only ground anchor with a specific fitting kit designed for installation in a van and similar situations. Many motorbikes, bicycles and other valuable items are stolen from vans, especially near motocross and other race venues where there are often hundreds of bikes arriving in vans and on trailers. Using the Torc anchor when the bikes are not being ridden changes easy pickings for a thief into a much bigger challenge. Make life difficult for them! Theft of commercial equipment from vans is also a major problem - lawn maintenance equipment, concrete mixers and other expensive tools are often stolen from vans left on the drive overnight, or by opportunist thieves during the daytime. Don't let them steal your valuable equipment! The Torc anchor van fitting kit includes high tensile bolts and security shear nuts and load-spreading penny washers. It is designed for easy installation in a van or other thin-walled metal enclosure (including bike safes). 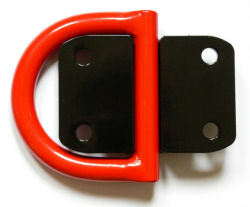 The Metal Shed Shackle is also designed for use in bike safes and other metal-walled structures. If you are unable to fit the anchor yourself because of landlord restrictions, for example, we can sometimes offer an installation service in partnership with professional fitters that are experienced with chemical resin techniques and security products. Price on application. 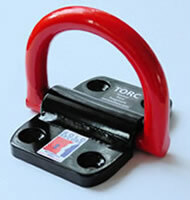 The Torc Ground Anchor is designed for permanent fitting, and so is really difficult to move once it has been fitted. So please, don't fit it in the wrong place! If you have to remove it, e.g. when moving house and the new owner doesn't see the merits of having an anchor available, it can be removed by cutting it out of the concrete. This will not be a quick process but if it is done carefully, the body of the anchor can be recovered and installed at a new location. Contact us for a new fitting kit. The cleanest way to cut it out is generally with the aid of a large (9") angle grinder with a concrete-cutting disc. This is a dangerous tool and should only be used by an experienced operator. We have recently launched the Double Doofer - a new removable ground anchor. This may be a good option for you if you know you will be moving house or needing to move a ground anchor! ...Close-up of one of the four fixing bolts after installation showing the ball bearing in position in the head of the bolt. The bolts are virtually impossible to remove even without these when the chemical resin is used. The Series II anchor has been designed to have plenty of capacity for 16mm and 19mm chains, here shown with a Protector 19mm x 1.0m long chain securing a brand new quad bike/ATV! Series II Torc ground anchor, this time in combination with an Anti-Pinch Pin & Protector 16mm chain, all protecting a Ducati installed in Australia! 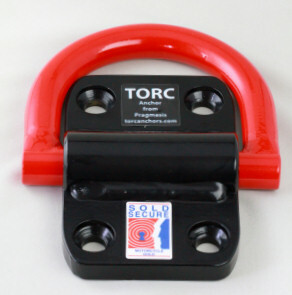 The Torc Series II ground anchor is available in our online shop, and also in several Package Deals with recommended chains and locks.